There is a misconception about children with autism and relationships. Autism comes from the Latin word “auto” which means “self”. This is why children with autism have been attributed the unsociable characteristic: the word “auto” implies selfishness. However, in reality, these children are interested in having friends, holding conversations, and learning about their environment. The problem is: they don’t know how to approach people or how to initiate social interactions. They need help, but they can not tell the world. Children with autism may seem to be living in their own world, but the truth is, they are amazing observers and great emulators. If they get the appropriate training, they would be able to communicate with the outside world. Why should we reinforce social interaction? Our goal is to prepare the children to live in a community and adapt to the environment. It’s all about integrating and blending them in the society. Most of all, they need to be as independent as possible. For this to happen, they need to interact with the rest of the world. 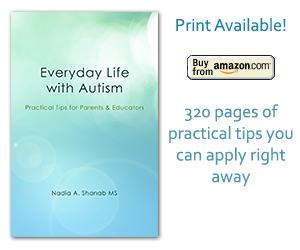 Here are some tips to encourage children with autism to interact. This is a great opportunity as all the children are gathered in the same place to do the same activity. The teacher interacts with each student individually, then encourages the children to interact among themselves. “How are you today?” If this is too hard to answer, the teacher may offer options. “Are you happy, are you sleepy, are you excited, are you sad?” And so on. Usually, the child would pick one, especially if the teacher is showing the facial expressions poster to the child. Remember, they are very visual. In regular education classes, this activity is a common practice. The students bring an item from home and talk about it. The teacher chooses the theme, talk about a picture, a book, a toy and so on. The student is required to sit (or stand) in the speaker’s place and tell his friends about her/his object. Once done with the presentation, the student would take questions and comments. The teacher then asks the rest of the class if the speaker mentioned three things about his object, and if she/he spoke out loud enough, then ask them to evaluate the speech by giving thumb up or down. At the end, everybody applauds the student for sharing her/his story. The same concept can be applied in special education classes, after making some modification -as we do with the curriculum. With the help of all facilitators in the classroom, a simpler and shorter version of the presentation usually works out very well. The child feels so proud and accomplished after giving her/his presentation. I completely agree and I just want to say that I really like your blog. Is this WordPress? Thank you! Yes, it is a WordPress. What?s Taking place i’m new to this, I stumbled upon this I have found It absolutely useful and it has helped me out loads. I am hoping to give a contribution & aid other users like its aided me. Great job. Thank you for your kind comment. I am glad the blog helped! Your feedback is highly appreciated. My brother recommended I may like this blog. He was once entirely right. This submit truly made my day. You can not consider simply how much time I had spent for this info! Thanks! Thank you for reading. I’ll keep posting! Heya i’m for the primary time here. I came across this board and I find It really useful & it helped me out a lot. I am hoping to provide something back and help others like you aided me. I am glad the blog helped you! Your feedback is very important. Thanks for reading.